MGT Debut Video For "Every Little Dream"
Goth-rock duo MGT has unveiled a music video for their brand new song, “Every Little Dream”. The song is featured on the band’s forthcoming album, Gemini Nyte, that’s due out on February 23rd from Cleopatra Records. The album is now available for pre-order at iTunes. MGT is the newly cemented collaboration between former THE MISSION/PETER MURPHY guitarist Mark Gemini Thwaite and vocalist Ashton Nyte of THE AWAKENING. The upcoming album Gemini Nyte features 13 new songs written and recorded by Thwaite and Nyte, plus Paul Ferguson (KILLING JOKE) on drums and guest appearances by Burton C Bell (FEAR FACTORY) and Lol Tolhurst & Pearl Thompson - founding members of THE CURE. 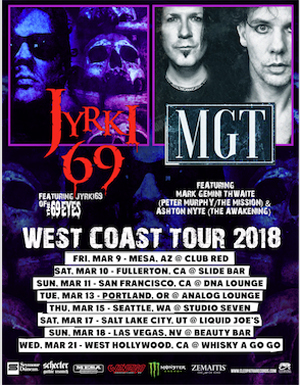 The band has also announced a special West Coast album release tour with labelmate JYRKI 69, the frontman for multi-platinum selling Finnish goth n’ rollers THE 69 EYES who released his debut solo album on Cleopatra last year. Dates are listed below.